Popular in the Victorian era, memorial lockets were worn to remind mourners of their dearly beloved. 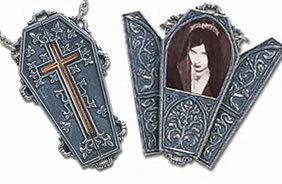 Often placed in these lockets were the deceased’s hair or photo. This coffin shaped memorial locket has an inset bronze door-cross and hinged doors revealing a window to take a cut-out photo. Measures 2 1/2"(L)Comes with 21" chain.